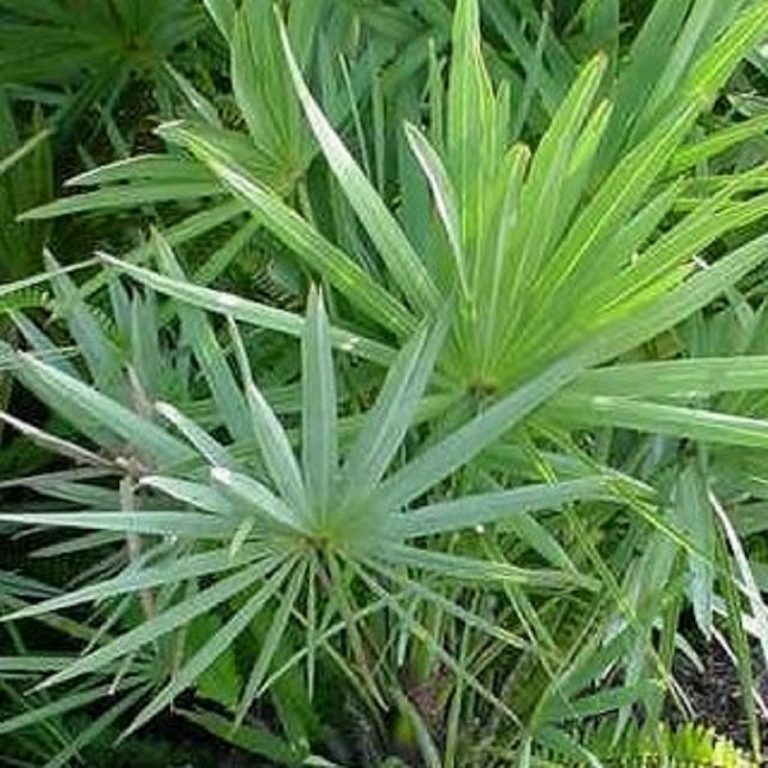 An evergreen palm that has a stem that is below ground. The stem may eventually, with maturity, reach above the ground as much as 3 feet. The petioles are smooth, but the leaf sheath does have a long needlelike spine. The leaf blades are fanlike without a midrib. The leaf surface is dark green above with lower surfaces and petioles having scaly pubescence. The flowers are small & in clusters that appear in the spring & summer. The fruit is fleshy, oval, or squarish to pear-shaped if crowded during growth. Reddish to purple-brown in color with a loose mat of tawny hairs that are easily rubbed off. It occurs naturally in wet to mesic woods, ravine slopes, and hammocks. Bees, flies & wasps use the flowers for nectar, and the berries are an important wildlife food. In the home landscape it grows in part-shade, with average to moist, well drained, organic soils. An evergreen shrub with a subterranean trunk that may eventually, with maturity, will reach above the ground as much as 3 feet. The petioles of the leaves are smooth. The leaves arepalmately lobed, with long filaments. The flowers are small, & in clusters born on stalks that appear in the spring & summer. The fruit is fleshy and round and bluish-black when ripe. It occurs naturally in dry pinelands, oak scrub, and sand pine scrub. In the landscape it grows in part-shade to full sun with dry to average soils. An evergreen shrub with a subterranean trunk, rarely emerging to 5 feet. 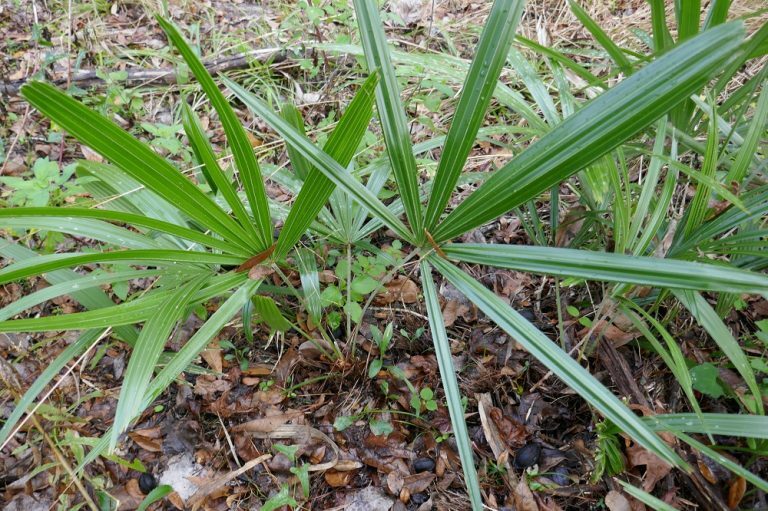 The petioles of the leaves are smooth, the leaves are bluish, & palmately divided into segments with a conspicuous V-shape, without filaments, without a midrib, and about 3 feet across. The flowers are small, borne in clusters near the end of the stalk, and blooming in the spring, summer & fall. The fruit is a shiny, black, berry. It is found in moist to wet woods. In the home landscape it can be grown in shade with average to moist organic soils. 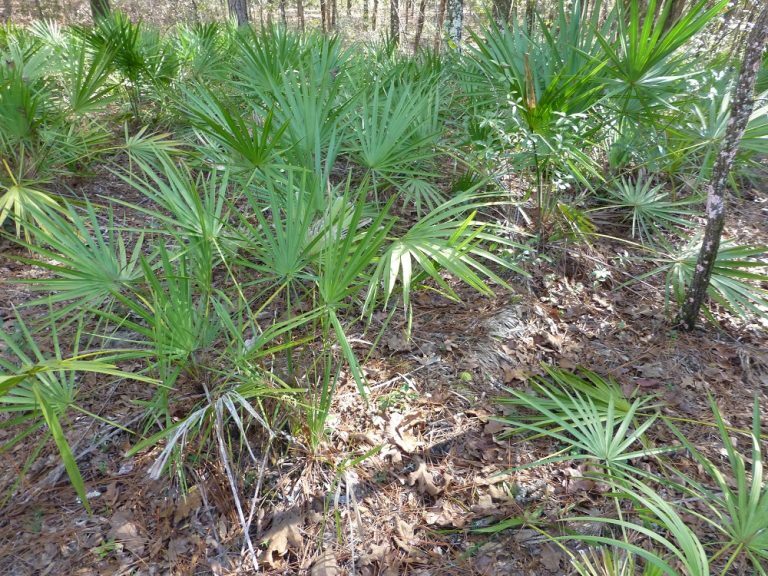 Buy bluestem palm seeds here! An evergreen tree with a single stem that may reach 75 feet in height. The petioles of the leaves are smooth. The leaf blades are fanlike with a midrib that curves downward, 3 feet across, divided into segments with a conspicuous V-shape, and having filaments. The flowers are born in long-stalked, drooping, clusters that bloom in the spring & summer. The fruit is a dark fleshy, small, round berry. It is found in pinelands, prairies, hammocks, shell middens, & swamps. In the home landscape it can be grown in shade to full sun with moist or dry, sandy or organic soils. 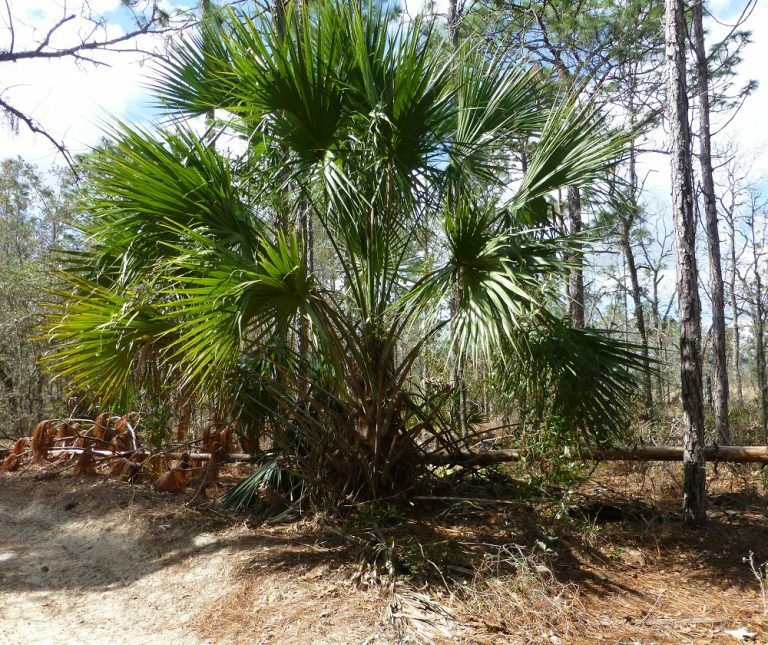 Buy cabbage palm seeds here! An evergreen shrub with above ground, horizontal stems that can reach 20 feet in height, but the average is 6 feet. The petioles of the leaves have sharp teeth. The leaves are palmately divided into segments without filaments, they have no midrib, and can reach up to 3 feet across. The flowers are born in spike-like clusters that bloom in the spring & summer. The fruit is a black, fleshy, round berry. 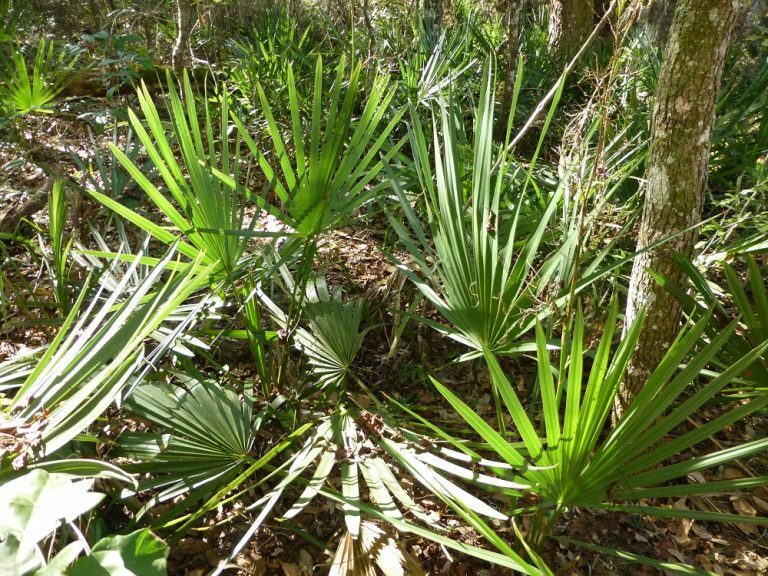 It is can be found growing naturally in wet to dry pinelands, flatwoods, and hammocks.